Zoom Dispatch makes it easy to manage your drivers, passengers and accounts from a single, easy to to use system (with similar screens to other popular taxi dispatch systems). 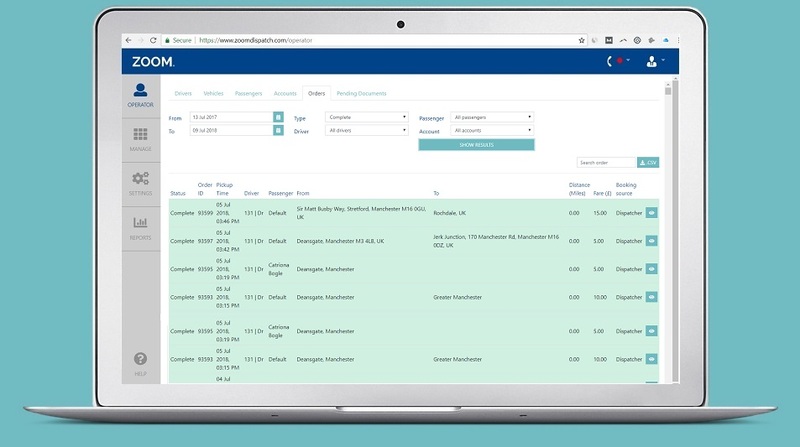 Passengers can book via telephone, an app or your website and Zoom’s automatic dispatch function ensures that jobs are allocated quickly and efficiently to the most relevant driver, providing the extra help you need to manage peak times without needing to take on additional operators. And Zoom Dispatch is flexible. You can set unlimited prices, zones and tariffs, and you can add and remove cars at any time, at no extra charge. Easy-to-read screens show you exactly what’s going on, tracking your cars and bookings in real time, and the built in reports gives you visibility of your, and your drivers’, earnings. By receiving your calls through Zoom Dispatch, returning callers will be identified and the operators prompted with their details before the call. The customer gets a better experience and the call is quicker. So whatever the size of your fleet, Zoom takes care of it all, and keeps you updated on every journey. Start your 6 week FREE trial today, and see for yourself. See how easy it is to link dispatch with your drivers, and let your passengers book via an app, text or voice. If you like what you see, why not take a 6 week FREE trial? Zoom could help you keep drivers, attract customers and win new business. From paying drivers to doing the paperwork, you’ve got lots to do – plus you’ve got to manage all the bookings too. Zoom takes care of everything and makes sure jobs go smoothly. Managing workloads at busy times can be a real headache, but help is at hand. Zoom’s automatic dispatch system makes sure jobs are sent to the most appropriate driver quickly and efficiently. That means you keep your drivers and your customers happy. With Zoom there are no monthly fees and no hidden charges. You just pay for what you use, with a fixed cost per journey. For branded passenger apps and booking widget there will be a small customisation fee. If you don’t want to take a free trial yet, no problem. Just give us your email address and we’ll let you know when any other offers come up. Don’t keep Zoom to yourself – let a colleague know about Zoom. Just to let you know, we won’t store any of these details. Making booking and managing fares easier, with automated dispatch and real-time reporting. Drivers see what they earn, and get the very best in class 3D mapping. And there’s no need to buy new equipment or mobile phones. Passengers can book a car in just a couple of taps, and get instant updates on the driver and the fare. Passengers can book directly from your website, using our simple widget. It’s easy to install, and it comes with your branding too. "A private hire company knew that it needed a new booking system. But they wanted help and advice, from a sales team they could trust.The Zoom team explained that they could work with the company to help them get the system up and running. The private hire company was pleased about the support that was available, and introduced the Zoom app for drivers and customers.Now the company is going from strength to strength, and is happy knowing that they can always reach the Zoom team when they need to." "A private hire company was facing stiff competition from Uber. The owners thought that their business would have to go under.But then they started using Zoom. The reliable system helped them cut downtime, and it was easy for customers and drivers to use.Because drivers were so much happier using the app, they stayed with the company. And because customers liked it too, the private hire company was able to get more business and carry on trading." What are the benefits of Zoom for managers? Zoom has a simple to use interface and the intelligent auto-dispatch allows for smooth operations as it minimises human interaction and delay. 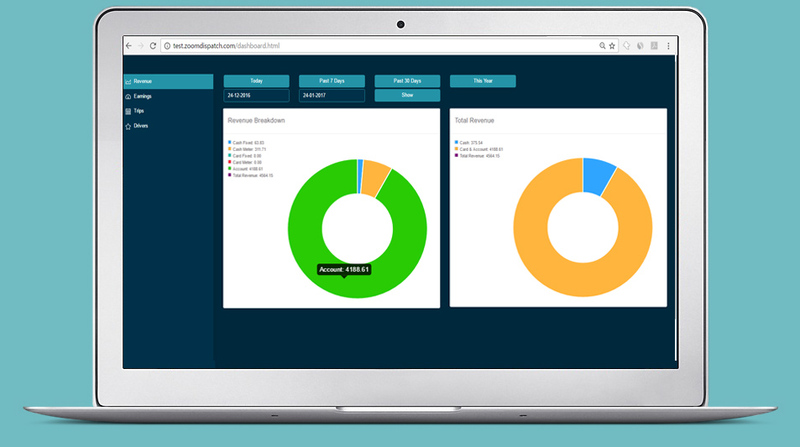 It is easy to manage drivers, customers, accounts, invoices and reports with just a few clicks of a button, and the VoIP integration creates ease of use. 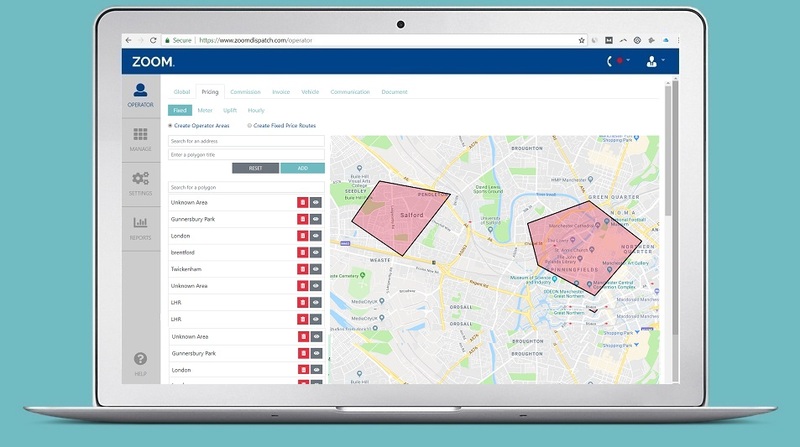 Managers will not be overwhelmed by this new system as it is similar to ‘standard’ cab software, but the additional layers of functionality and reporting will allow for much more productive day-to-day operations. Do dispatchers have to do anything for jobs booked through the app? No. All bookings made through the app or website will be automatically dispatched. The operator will be able to see these bookings coming through the system but it will not require any intervention. Can I receive calls through the dispatcher? Yes. We have an integrated phone system within the dispatcher. You can request a new phone number through the web page. You can then either direct your customers to phone this number, or forward your calls to it. Then you are able to receive calls on the main screen of the dispatcher. Can I change how the system treats jobs and pricing? Yes. You are able to change the way pricing is calculated: Fixed pricing for certain journeys, prices per mile, and specific prices for different vehicles. You can also choose the type of route to base your pricing on, the distance for which you will accept jobs, commission amounts for your drivers, and which vehicles can be substituted if the requested type is not available. Zoom is a cloud based system that’s designed to help private hire companies fight back against Uber. 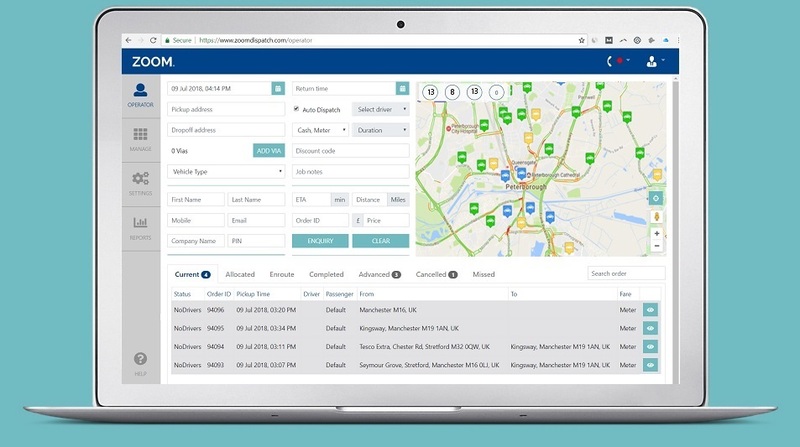 It makes dispatch simpler, saves costs and helps grow your business, while giving your customers a first class experience. And our unique pay as you go pricing model ensures that you only pay for what you use. Try Zoom today with our 6 week FREE trial offer.